Portable inputs that provide a built-in dock connector. A 5.25-inch sub woofer with a 3.5mm input jack for other audio sources. "As more customers begin to use their smartphone as their primary portable music device, it becomes more important for them to be able to enjoy premium sound quality no matter where they are," said Michael Cowan, director, product marketing management of Accessories for AT&T. 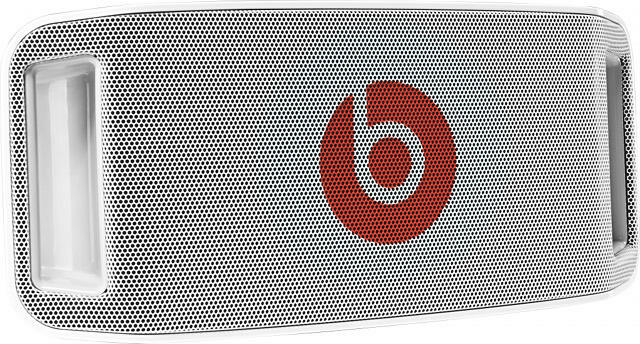 "The Beats by Dr. Dre Beatbox gives consumers an opportunity to experience their music in its purest form without sacrificing quality for portability." AT&T also reconfirmed that it will issue an Android 4.0 Ice Cream Sandwich software update for HTC Vivid customers that will enable Beats by Dre audio profile support. The audio technology will also be supported by AT&T's HTC One X, which will launch later this year. · AT&T customers will soon be able to enjoy their favorite music wherever they are when the Beats™ by Dr. Dre™ Beatbox Portable high performance wireless audio system arrives in white and black, exclusively from AT&T* at company-owned stores or online at www.att.com beginning March 11 for $399.00. · Beats By Dr. Dre offers rich, full sounds with professional-grade sound engineering to play the music how the artist intended with a distortion-free sound at higher volume and real bass at all levels. · The Beatbox will be featured on AMERICAN IDOL Wednesday March 14 (8:00-10:00 PM ET live/PT tape-delayed) on FOX when mentor and Beats By Dr. Dre co-founder Jimmy Iovine incorporates the high performance wireless audio system into his coaching sessions with the finalists. · AT&T recently announced the HTC One X™ with Beats By Dr. Dre Audio™ integration letting customers experience rich, full sounds with professional-grade sound engineering in videos, gaming and music. · In the coming weeks, HTC Vivid™ customers will be able to enjoy the optimized audio experience through an upcoming software update that will provide Android 4.0, an updated HTC Sense™ experience and Beats By Dr. Dre Audio profiles. · Portable inputs that provide a built-in Dock Connector for smartphones or portable music players, plus Bluetooth™ wireless. · Full-featured remote with On/Off, Volume, Mute, Scan and Skip buttons. · Easy-carry handles on both sides. · The ability to operate on either 6 D-cell batteries or a computer power supply. · A 5.25 inch woofer and 3.5 MM input for other sources. · Wireless HD Stereo Bluetooth Headphones, $280 – Engineered by Monster® with a built-in microphone and control buttons on the ear cups for hands-free mobile calling and track and volume control. · Beats™ Solo™ HD Headphones, $200 – Feature high definition sound, proprietary titanium coated driver technology and a comfortable, lightweight design that is ideal for active lifestyles. · UR Beats™ In-ear Headphones, $99 – Includes the signature Beats experience in a sleek, compact design. Solid metal housing resists vibrations for the purest sound without sonic side effects, while ControlTalk makes hands-free calling and music control possible.